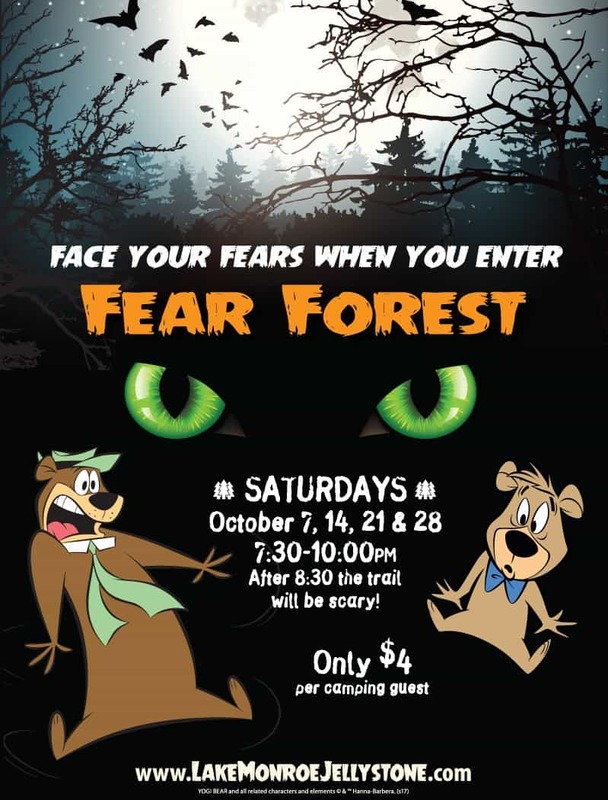 Halloween Camping at Lake Monroe Jellystone Park™ is a HOWL! Halloween Camping at Lake Monroe Jellystone Park™ is a HOWLING Good Time! Fall is a great time for camping. The smell of a campfire in the night, the sound of rustling leaves, and a special feeling in the air that abounds. There is a change of season that brings new fun events for everyone to enjoy. Fall does not mean the end of the camping fun at Lake Monroe Jellystone Park™ Camp-Resort, it means fall and Halloween! The fun starts early, so make your reservations to enjoy a “non-scary” Halloween celebration that includes the Magic pumpkin patch, pumpkin painting, games, color your Yogi Bear™ Halloween tote bag for candy collecting, costume and site/cabin decorating contests and of course trick or treating for the kids. We will even end the day with a Glow Stick wagon ride! Lake Monroe Jellystone Park Halloween campers are always in for a good time. Get ready for our fright and fun fests and enjoy a full month of celebrating Halloween with Yogi Bear™, BooBoo™ and Cindy Bear™. Lake Monroe will have games, arts and crafts, pumpkin decorating and carving, trick or treating, costume contests and site decorating. Our resort style campground even has a Haunted Trail that you can purchase tickets for. If you’ve never been to our Bloomington Lake Monroe Jellystone Park during Halloween season – you’re missing out for sure! Get in on the family fun and deck out your campsite or cabin in its ghostly best, creep your way through haunted forests and mazes, enjoy the boys and ghouls in their costumes as they trick or treat through the park, play spooky games and enjoy the very best that our park and the season has to offer. Halloween is such a big event for our Jellystone Park that it’s a month-long celebration. Please visit our Activities and Themed Weekends and pick out your favorite schedule of events. Make your reservation today and have a Ghoulishly good time!